As ‘Anchor Baby’ premieres today BY 5pm at the Silverbird galleria in Lagos, the excitement around the movie has gotten a lot more intense. Hollywood actor Sam Sarpong and Canadian actress Terri Oliver will both be storming Lagos for the premiere of ‘Anchor Baby’. Veteran producer and movie director Lancelot Imasuen speaking on ‘Anchor Baby’ at the African international film festival said ‘Anchor Baby’ is the best film from the Diaspora that I have seen in 2010. It has a compelling storyline and the acting was excellent. 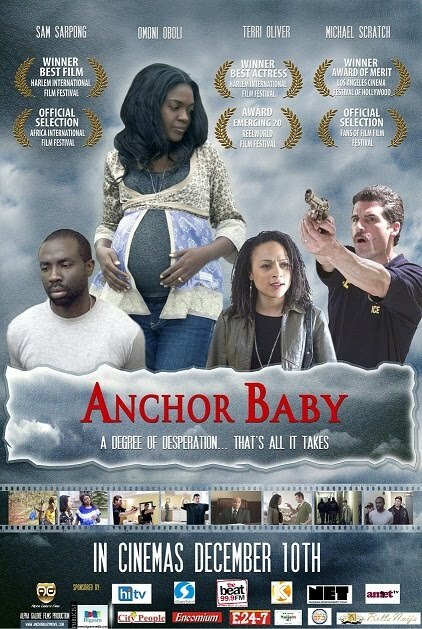 Sliverbird Cinemas, Nigeria’s foremost cinema-house on their face book page recently announced award –winning movie, ‘Anchor Baby’, as the best film to hit the cinemas this year since Ije. A film that had Caucasian, Hispanic, Asian and African characters playing major parts, ‘Anchor Baby’ tells the tale of a married illegal immigrant couple living in the US, Joyce and Paul Unanga. They have been ordered by the US immigration to leave the country by voluntary departure. They agree to leave; but only after Joyce who is 5months pregnant delivers her baby inside the US. This will guarantee automatic citizenship for their child. Ignoring the deportation order, the couple goes into hiding. Paul was later caught and deported while Joyce stayed back to struggle on her own to achieve their dream. The love, hope, pain and struggle that came with this decision is bound to stir up some emotion in you. ‘Anchor baby’ won international awards from the Harlem International Film Festival as the best film of the year and ace actress Omoni Oboli was pronounced the best actress for her roles in ‘Anchor Baby’. It has also been selected as one of the main attractions at Africa International Film Festival. The movie features A ‘list actors like Omoni Oboli, Sam Sarpong, Terri Oliver, Colin Paradine, Michael Scratch, Mark Cassius, Rachael Ancheril, Cyrus Faird, Santiago Lopera, and Chris Patterson and about 60 extras 'Anchor Baby' will be in the cinemas all over Nigeria from December 10th.